DCF Disgrace in Methuen ~ What is DCF Costing Methuen Taxpayers? After The Valley Patriot learned last month that Department of Children and Families (DCF) officials were refusing to cooperate with Methuen Police in the case of missing 13 year old Jessica Jiminez, we asked the police department to provide a list of how many police calls the cops have responded to regarding children in DCF care within the city. We wanted to know how much the Methuen tax-payers are spending in man-hours, and overtime for the lack of control DCF has over the children in their custody. In the first four months of 2017, the Methuen Police have responded to DCF calls for missing children 18 times (from the Mystic Street Key Program), and 24 times on Lowell St. (at the time we went to print). 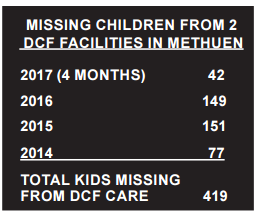 That’s 42 missing kids in the first four months of this year alone from only two DCF facilities in Methuen. Police also responded to DCF for other types of police calls at the Mystic St. location 17 times, while they were called to the Lowell St. location 20 times. That’s a 2017 total of 37 police calls for criminal complaints not related to missing children. That’s a total of 79 calls for police to respond to two facilities in four months. 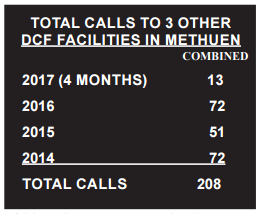 There are a total of five DCF facilities in Methuen. 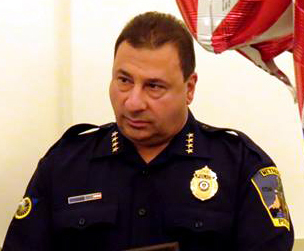 By comparison, so far this year, Methuen Police have only responded to a total of 13 calls for service of any kind to all three of the other facilities. So, for detective time only we are talking about 780 man hours last year. If you want the total cost you have to double or triple that. Solomon says the number of police calls to these two facilities are higher than the others because those other three are lock-down facilities. Asked why the problem has spiked in recent years, Solomon said that DCF does not want to change their policies and procedures. “Once you tell the kids there are no ramifications for your actions, once you tell them ‘we are not going to physically stop you and there is no punishment, no negative consequences’, it becomes a game. The tail is wagging the dog at this point. The kids have all the power. Solomon says he met with DCF staff and a representative from the head of DCF. “I don’t know if you remember the runaway from DCF on Lowell St., last December. We found her, returned her, and DCF placed her with a relative, where she ran away again that night. We found her in Lawrence and she had been shot. She did survive. But they are ‘extremely concerned” he said frustrated, rolling his eyes. “I know I’m going to take heat for this but, I was very disappointed by the lack of real concern by DCF. They just aren’t taking any of this very seriously. “I never heard back,” he said in frustration. 3 Responses to DCF Disgrace in Methuen ~ What is DCF Costing Methuen Taxpayers?